In the past I’ve blogged a number of times on coffee in Thailand. (Links included at the end of the article.) 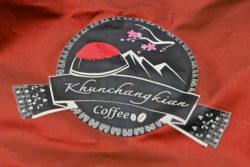 As Kasma and I traveled around the north this past month – up to Doi Ang Khang and to several out-of-the-way places in Chiang Mai province as well as Chiang Mai itself – I couldn’t help but notice the changing coffee scene. This is by no means a comprehensive review. Like my other blogs it contains my impressions and observations about the changing scene here in Thailand as I observed them. Each year there are more coffee shops in Thailand. More and more locations with shops or market stalls of any kind seem to have one selling fresh coffee. 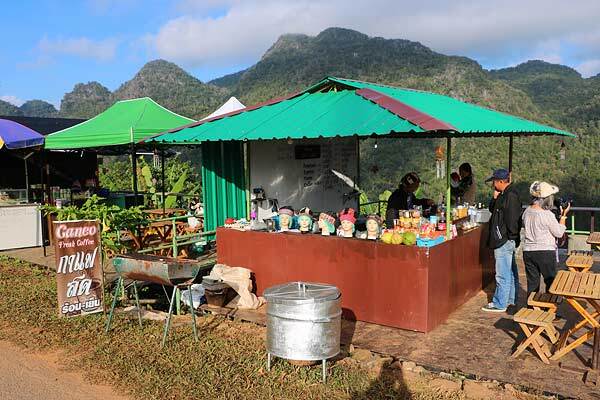 Driving through the countryside on the way from Doi Ang Khang to Chiang Dao, we stopped at a viewpoint with a number of shops and, sure enough, one of them was a coffee place (pictured to the left). In addition to pretty good coffee, it offered some beautiful views of the mountains. 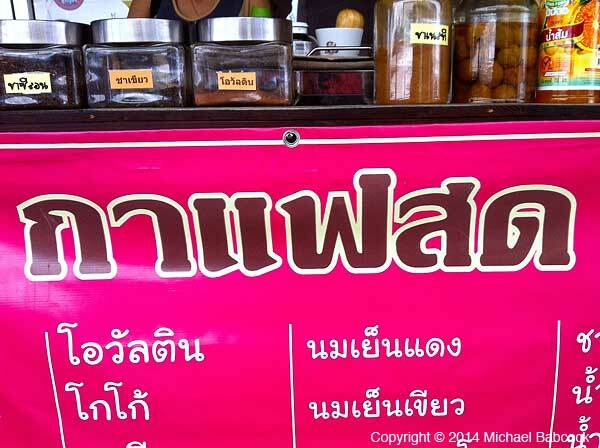 We often saw the signs for กาแฟสด (ka-fay sot – fresh coffee) at roadside stops and on random streets in various towns. 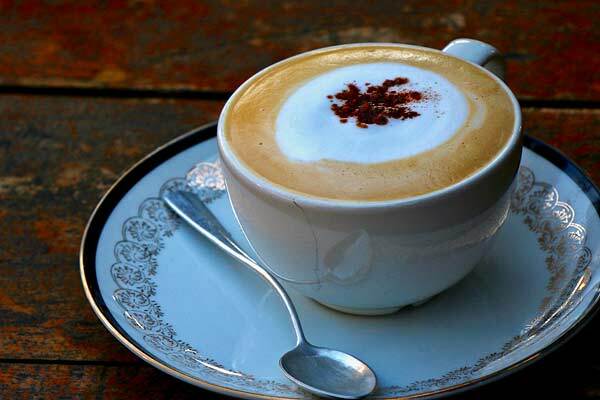 Typically, the coffee is ground to order and then made using an espresso machine. You don’t really get drip coffee here in Thailand; if you order a black coffee you get what is essentially an Americano – basically an espresso with water added to make it about the same strength as a brewed or drip coffee. I’ve noticed that more and more of the baristas are ma//www.thai better quality drinks. I almost alway order a cappuccino. When correctly made a cappuccino is espresso with just milk foam on top and no added milk. In the past, about half the time you’d get what was essentially a caffe latte, with straight steamed milk and not so much milk foam. Only once this year did that happen. More and more I’m starting to see foam art on the drinks as well. Another change is that fewer places serve a small glass of tea with your coffee. In past days nearly every coffee shop would serve you a small glass of tea along with your coffee, to clear out the bitterness. Even the Amazon at Imperial World used to do this and didn’t this year. We were served that tea maybe twice this year. There are coffee beans available from many more growers these days. 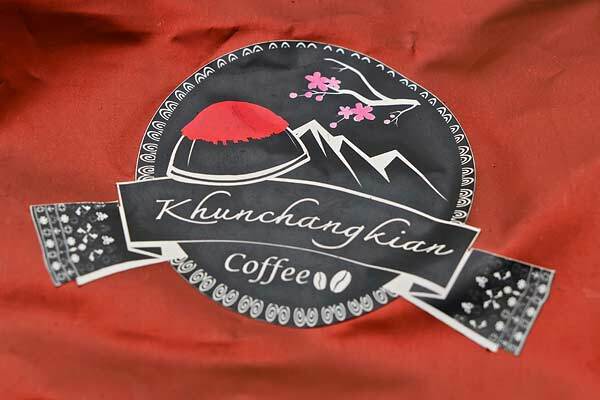 We drove up to the Hmong village of Ban Khun Chang Khiang above Doi Suthep in Chiang Mai and had a very good cappuccino at a coffee shop advertising “local coffee.” In fact, the shop grew their own coffee beans. Later on, as we walked through the town, we stopped to buy strawberries at a stand and I noticed that they had ground coffee beans for sale. I bought a bag and it’s pretty good coffee. They had both medium and dark roast available. They, also, grew the beans they were selling. 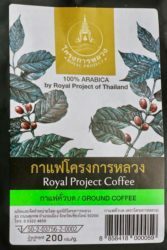 The Royal Projects now offer coffee beans for sale, both ground and as whole beans. I picked up a bag at the Royal Projects Fair this December in Chiang Mai. The encouragement and support given by the Royal Projects explains much of the proliferation as hill tribes and rural areas are encouraged to grow coffee beans for economic gain. They are also taught how to roast and market their own beans so they can control the whole process from growing to selling. The community of Doi Tung was one of the first to do this. 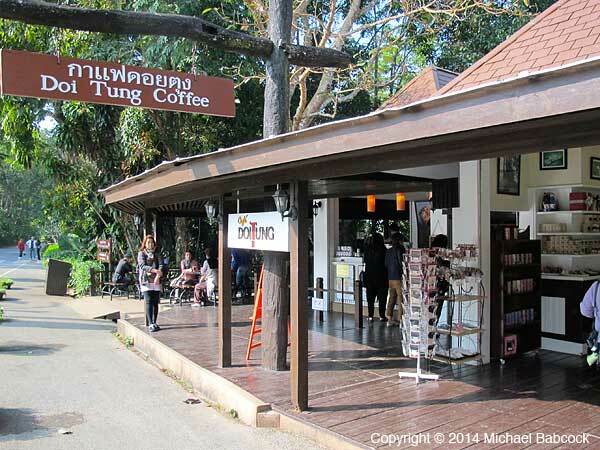 There are also a number of Doi Tung Coffee Shops, both at Doi Tung and also in Bangkok, Chiang Rai and Chiang Mai. (Here’s a list of their branches and here’s my recent blog on Doi Tung.) Doi Chaang is another hill tribe community that has grown coffee for at least 10 years and they, too, have their own cafes. 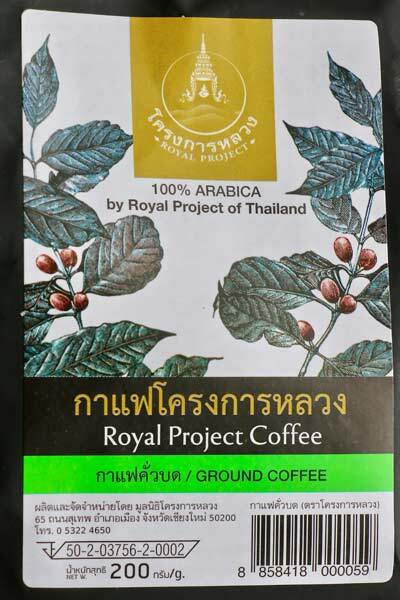 In the supermarkets associated with the malls here in Bangkok, I often see a half dozen or more different types of ground coffee beans available – typically in 200 gram bags. Many supermarkets also have a brand of beans that you grind at the market, one way to insure fresher coffee. Spea//www.thai of drip coffee . 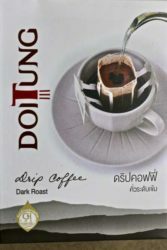 . .
A couple of years back the only place I know that was ma//www.thai pour over coffee – where you get a quantity of ground coffee in a little apparatus that you can place over a cup and then pour hot water through to get a drip coffee – was Doi Tung. Then last year I found it at Black Canyon. 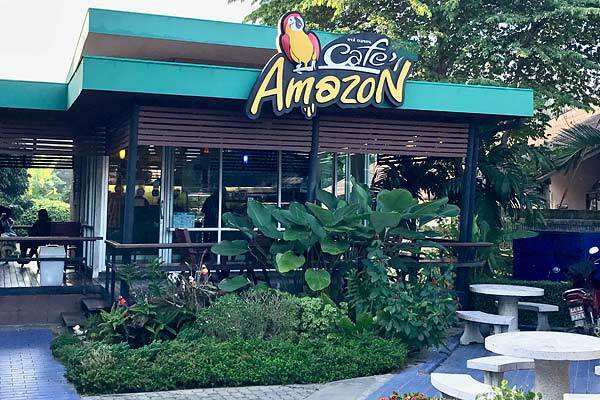 This year the big chain of Amazon started selling it – it appeared to be pretty popular as many of the Amazon cafes we stopped at had empty shelves because they had sold out. Then at the Royal Project Fair in Chiang Mai, I found Royal Project pour over coffee. Doi Tung charges 150 baht for 6 packets; the other three charge 120 for 5. 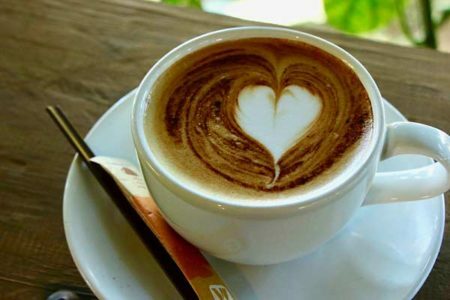 Of course there are disadvantages – the freshness of the coffee depends on how long ago the beans were roasted and ground. 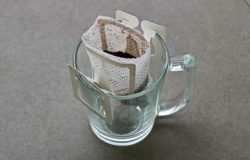 You are also dependent on how much coffee is in an individual package (it varied from 10 to 15 grams) for the strength. Nonetheless, I always travel with some now. Many hotels offer buffet breakfasts but they very seldom have brewed coffee – and when they do, it can range from OK to awful. Usually what’s available is instant Nescafe, which isn’t terrible and also doesn’t have the taste of brewed coffee. There’s almost always hot water available, so I just bring my pour over and make myself a cup. Usually the first cup is about the strength I like. I’ll do a second pour over, sometimes a third, just for the taste of real coffee. 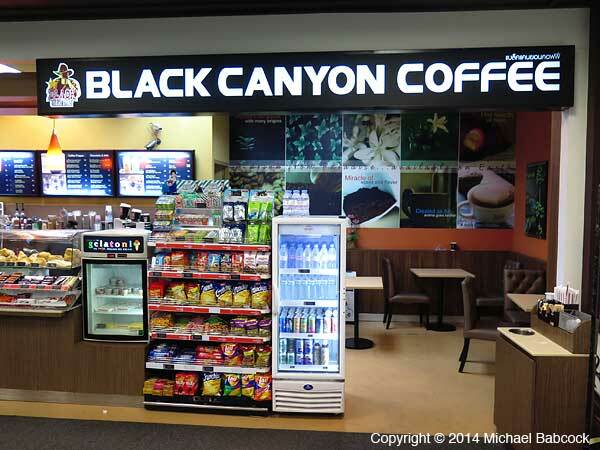 There are a number of chains in Thailand – Black Canyon was the first and started out in 1993. It’s also the most international with a presence in Malaysia, Indonesia, Cambodia, Laos, the Philippines and Myanmar. 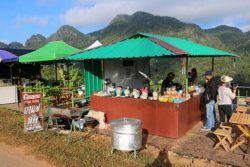 On the Black Canyon website they say they are “first Thai-owned specialty coffee retail business.” There’s the Cafe Rabika. Coffee World is another one. There are the smaller chains of Doi Tung and Doi Chaang. 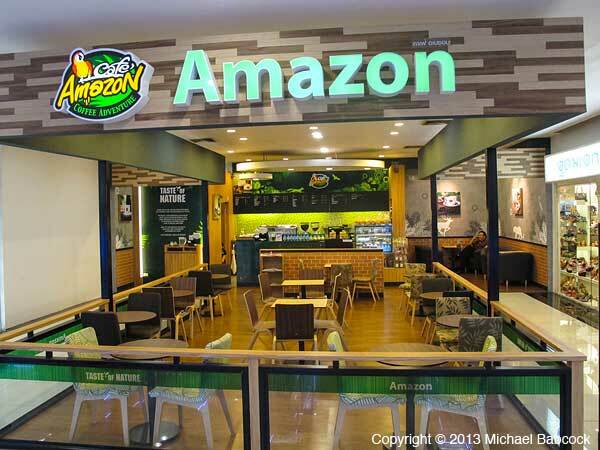 Certainly, the most widespread chain is Cafe Amazon, which was founded in 2002. At first we saw Amazon mostly at the occasional BP gas station. Now, it is unusual to find a BP station that doesn’t have a Cafe Amazon. They are also expanding elsewhere in a big way. Two years ago one showed up in the trendy Thong Lo neighborhood (on Sukhumvit Soi 55) and last year one opened near the Bearing BTS station close to where we live when in Thailand. It is more and more common to find one at the malls. There is even an Amazon at the Royal Park Rajapruek in Chiang Mai. They seem to be everywhere. When traveling we will get Amazon coffee quite often because they are so conveniently located at the BP stations. One thing I appreciate is that the price is consistent at all their cafes – a cappuccino is 45 baht, whether in a trendy neighborhood or a gas station. As a side note, 45 baht is a fairly standard price for a cappuccino in Thailand. Some smaller shops charge 30 baht and I’ve paid 70 baht at Black Canyon (albeit for a larger size); Starbucks is the most expensive of all. 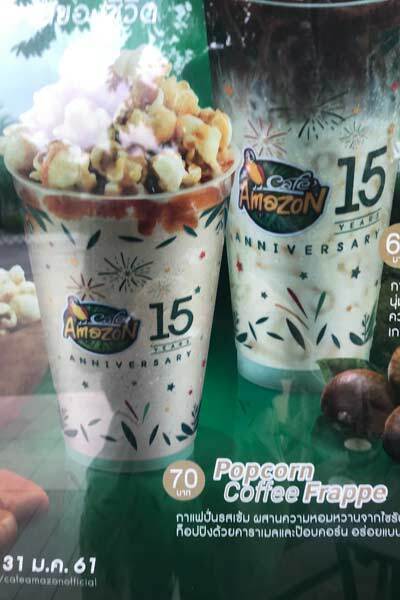 Last year Amazon started offering “Premium” coffee at some of their cafes – a premium cappuccino costs 70 baht, a 55% price increase. I tried it once and didn’t feel it was worth the extra cost. One change we’ve seen this year is the increase in Amazon labelled convenience food – cookies, chips, cakes and the like. Also, as noted above, they’ve added their own brand of pour over coffee. 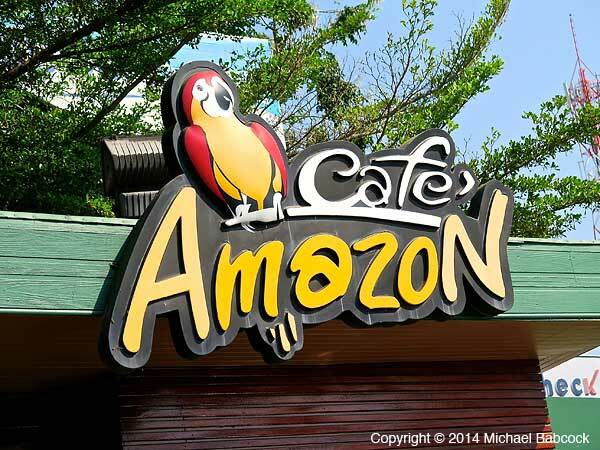 Twice this year we’ve come across a much larger and fancier Cafe Amazon. Kasma’s comment was that they are trying to be more like Starbucks. 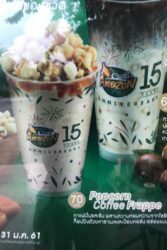 As part of this, they’ve started offering more specialty drinks, such as the Popcorn Coffee Frappe. These specialty drinks seem to be every bit as unhealthy as their Starbucks counterparts, including enough sugar to hurry you on the road to diabetes. Spea//www.thai of Starbucks, I avoid them. On a couple of occasions (someone wanted to meet at a conveniently located one; I needed to use a bathroom desperately) I’ve gotten coffee at a Starbucks in Thailand and it just is not very good coffee. And it’s more expensive than anyplace else: the prices are pretty much equivalent to what you would pay in the United States. This year the quality of the product at Amazon seemed less consistent than in the past. The coffee at our other local Amazon, at Imperial World Shopping Center in Samrong, seemed weak and muddy the time I tried it. There seems to be more of a variation as to what I can expect when I get my cappuccino from a Cafe Amazon these day. When possible I’ve begun to search out local alternatives. Coffee in Thailand, Part 2. 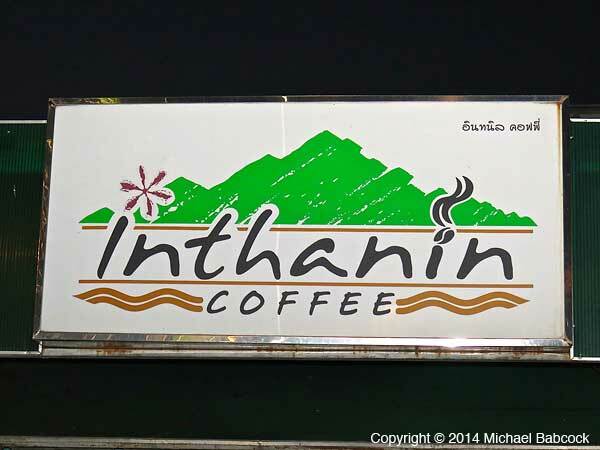 Coffee in Thailand, Part 3 (The North) – includes a section on Cafe Doi Tung. As part of my ongoing series of blogs on coffee in Thailand, I wanted to just touch briefly on something that I’m seeing more and more here in the Kingdom: upscale coffee shops with western-style pastries. I’m seeing these fancy coffee houses more often both in malls and as stand-alone shops. I’ll look at just a couple of them, which can serve as examples. 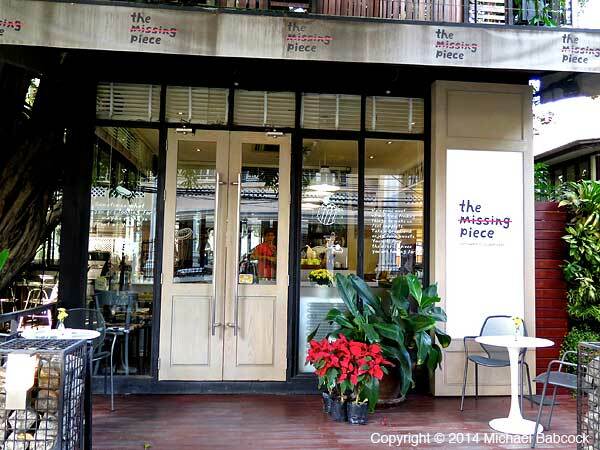 The Missing Piece is part of a complex that includes the Moon Glass Social Bar and an excellent restaurant, Baan Khanita at 53 (Sukhumvit 53). They are located on Sukhumvit Soi 53, the soi just before Thong Lo (Sukhumvit Soi 55); the upscaleness of Thong Lo is spreading! The Missing Piece is a small cafe (just a few tables). When you go in, you can see a selection of western-style desserts, including several types of cake and the passion fruit tartlet, which we ordered (see photo below left). It’s a pleasant, clean shop; the barista was dressed in a uniform of sorts, which seems to be the norm in these more upscale places. Another characteristic of these shops is that the baristas all seem to actually know how to make the drinks correctly. At some of the smaller, individual stands, you never quite know what you’ll be getting. At one stand in Khao Yai National Park, for example, the latte consisted of an Americano to which the barista added some condensed milk. 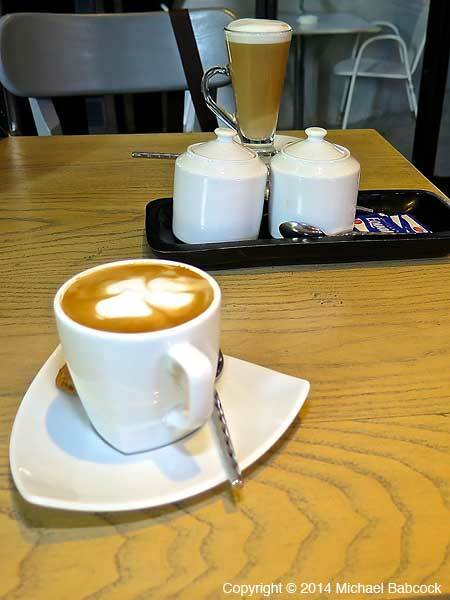 Here, I ordered a cappuccino and my wife ordered a caffe latte – you can see the results in the picture above. The drinks were perfectly fine: good coffee, nothing extraordinary. The tartlet was pretty tasty: not bad at all. We had a slice of chocolate cake on another occasion and it was delicious. Another characteristic of these shops is that you’ll pay a bit more for coffee. 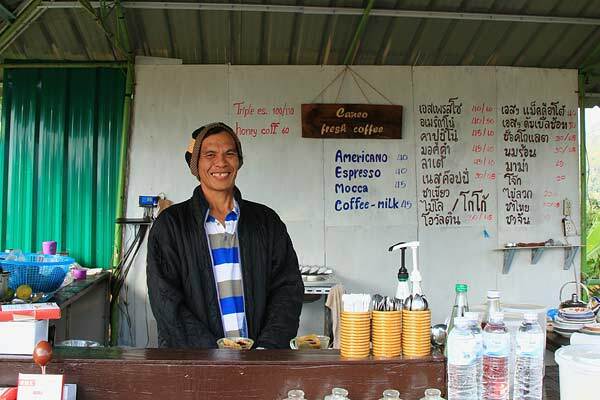 In smaller one-off stands or shops, you expect around 35 to 40 baht per cappuccino or latte. 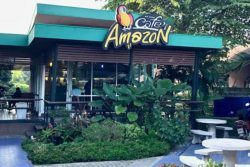 In the chains (such as Amazon, or Doi Inthanon) you’ll pay a bit more: 50 to 60 baht, and our local Amazon Cafe (in the Imperial World mall in Samrong) charges 70 baht for a cappuccino. To be sure, in some places such as airports, the prices are already higher. 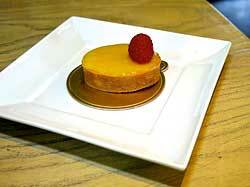 Here the price was 70 baht plus another 70 for the tartlet (the cakes were 110 baht). 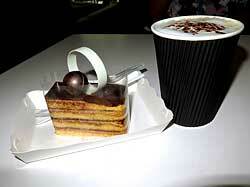 With VAT and service charge, we paid 243 baht for our two drinks and the small pastry. Definitely upscale pricing for Thailand. This is the only coffee shop where I have ever been charged VAT and a service charge. I should note that the chains have gotten on the western dessert bandwagon. I had a cheesecake at our local Doi Inthanon and the local Amazon Cafe has cheesecake plus other cakes as well. As a side note, Starbucks is among the most expensive coffee places – drinks seem to cost what they do in the states, which is high for Thailand, and even higher than at these (much nicer) individual, upscale coffee places. My advice is to avoid Starbucks; besides, the coffee is just not that good there. My second example is Ease Café at the Impact Muong Thong Thani Center. We attended the annual December pre-Christmas OTOP City here. Side note: if you are ever in Thailand before Christmas you must go to OTOP City. OTOP, of course, means “One Tambon, One Product” and cities and regions all over Thailand participate in making handicrafts and products of anything you can think of. At OTOP City you get to see the best that the provinces of Thailand have to offer, all in one place. A fabulous event with (a guess) around 1,500+ booths. 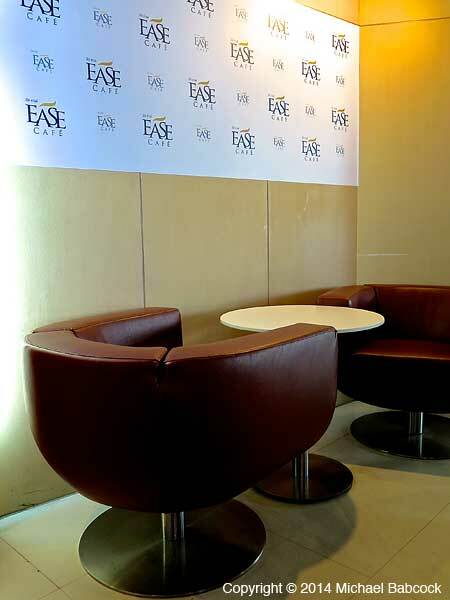 Ease Café includes nicely made coffee drinks with beautiful western-style desserts. Above left is the caffe latte Kasma ordered along with the multi-layer cake we sampled. Both were quite good. The trend of higher prices continues here. The latte and cappuccino came in 3 sizes at 70, 80 or 90 baht. 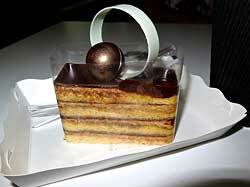 The cake was only 65 baht. There was no VAT or service charge here, so our two drinks and piece of cake came to 210 baht. Offering different sizes for drinks such as cappuccinos and lattes is also somewhat new in Thailand (except for western chains): in the past (and at most shops today) there was just one size offered. The first place I saw multiple sizes at a Thai cafe was at Café Doi Tung last year. 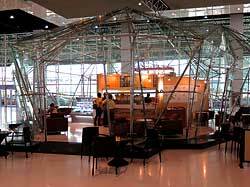 Above left you can see the cafe as it is situated inside the Impact event center. Also, true to form, the interior is quite clean and somewhat fancy, as you can see with the photo (above right) of the sitting area. All of it is très moderne. The baristas were all dressed in uniform, another continuing trend. It’s a comfortable quiet place, a good option for taking some time out from the event you are attending. Watching the coffee culture grow in Thailand is interesting and fun. 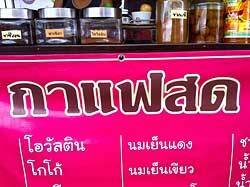 I see the กาแฟสด (kafae sot) – fresh coffee – sign in more and more places, sometimes in a sleepy little town in the middle of nowhere or in some back alley in Bangkok. In addition to the upscale cafes, I’m seeing more chains, some of which I’ve never seen before and others (Doi Inthanon, Amazon, Black Canyon ) that seem to be increasing in number. 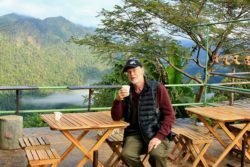 There has been a veritable explosion of places to drink coffee all over Thailand, especially during this past year. More restaurants have their own espresso machines. 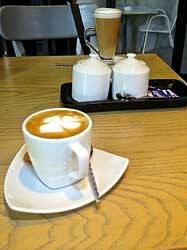 I see more Thai people drinking coffee; they are the main clientele for most coffee shops. One thing I seldom see is drip coffee – it’s nearly all expressed (espresso, Americano). Also, very few places have decaffeinated coffee (one exception being the overpriced Starbucks). I guess the Thais wonder what the point of decaf is.